As Vivid Projects closes to make way for the cold Digbeth winter, we have (some) time to reflect on our dynamic and fast-paced eight month opening season, which has seen over 3000 visitors to see 75 works at 41 events. 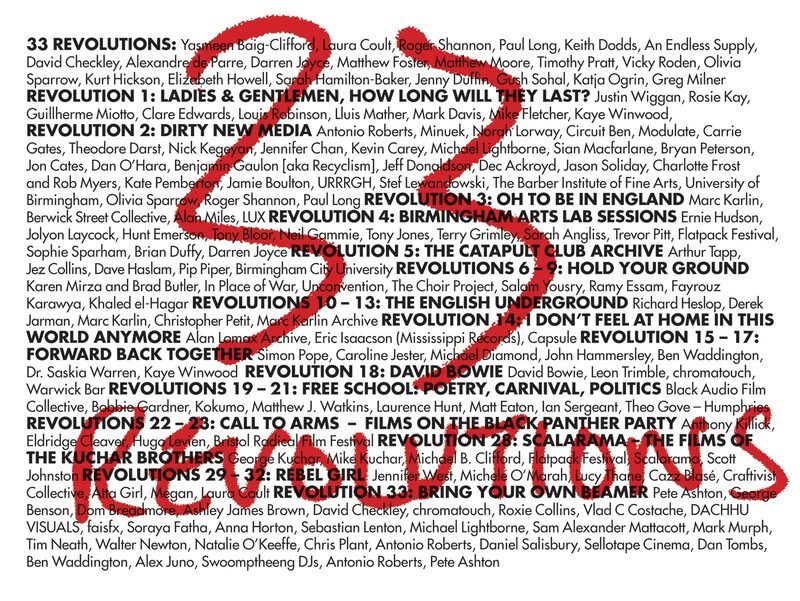 Massive thanks to all the artists, collaborators, freelancers and audiences who joined us on our Revolutions journey. Thanks to the brilliant work of our designer Keith Dodds, we have a fantastic set of A0 posters tracing the 33 Revolutions programme. The posters are available at a cost of £20 each – please email laura@vividprojects.org.uk if you would like to order a poster. Looking ahead, 2014 sees the launch of The Black Hole Club; set to be a lively, daring space for artists, academics, curators and producers to share ideas and experiences. The emphasis is very much on the club vibe: convivial, special, supportive, reflective of the membership, open minded and eclectic but grounded in a shared belief in quality and values. It’s something we are building with artists, supporters and audiences, and we intend for it to be sustainable. The first cohort will be announced in February 2014 and the club will be activated for public and private consumption in March. In the meantime, we are making the project space available for hire and full details are available here.